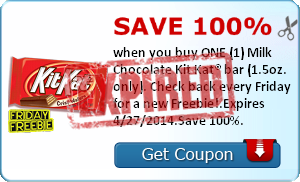 Save 100% when you buy ONE (1) Milk Chocolate Kit Kat® bar (1.5oz. only). Check back every Friday for a new Freebie!.Expires 4/27/2014.Save 100%.